500 Miles: With five weeks left, will I complete my challenge? 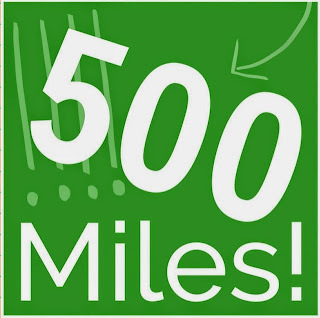 Earlier in the year I set myself a challenge to walk 500 miles by the end of July, see my original post here: 500 Miles. At the time I said it might not seem much of a challenge, but to me it was (and is) as I change my lifestyle. Clearly it's not in the same realms as Davina's Comic Relief challenge where she also covered 500 miles in a much shorter timescale, but it's my personal challenge about how to stay more active in my home-based life. Some people I know, on learning of this challenge immediately dismissed it and said I'd do it no problem. And at the start I did wonder if I'd been too easy on myself, however as the months have gone on and other things have vied for my attention walking my twenty one miles a week hasn't been so clear cut at all. 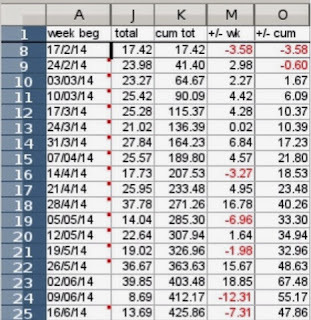 There's been weeks when I've smashed the total and equally there's been weeks when I haven't even got close. Some of that will be down to app failure - or rather user failure as I failed to notice the app wasn't running, and some of it is because I just didn't walk that far that week! So the last time I posted an update in April, I'd clocked up 207.53 miles and was 18.53 miles over my target cumulative weekly total. So what are the stats now? As of last Sunday my total mileage was 425.86 miles, and I'm 47.86 miles over where I planned to be at this stage, but as you can see from below the number of recent red (or under-target) weeks in the past few weeks is quite high. And higher than I want them to be, so I'm not planning on resting on my laurels (or anything else!) just yet. So with just under seventy five miles and five and a bit weeks to go, I should do this. But I still need to put some effort in to make that happen. I'll let you know, at the start of August how I did!